How well do you know your sharks? Odds are most people only know the sharks that have been portrayed as vicious killers in Hollywood thrillers, such as the mighty great white shark in the 1975 blockbuster hit “JAWS.” But the truth is there are over 400 different types of sharks in our oceans and aquariums all over the world and, despite all the horror stories, sharks do not eat people. Sharks come in all sizes from the massive whale shark, reaching lengths of 30 feet, to the dwarf lanternfish that’s less than 10 inches. Being able to tell the hammerhead from the nurse shark is quite easy, but others can be difficult. Can you spot the difference between a leopard shark and tiger shark? How can you tell one from the other? Sharks’ teeth are adapted for what they eat. Sharks like the great white and tiger shark have triangular teeth with jagged edges. This keeps hold of larger fish and animals, tear chunks of meat or slice through a turtle’s shell. A sand tiger’s teeth, on the other hand, are long and narrow which make them look frightening, but in fact these types of sharks are not very aggressive. The shape of their teeth is ideal for grabbing a hold of prey. 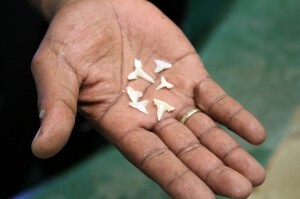 However, the whale shark has very small teeth and it’s not used for biting because they simply filter their food. Coloration and patterns play an important role in identifying a shark. Their special marks allow them to camouflage perfectly into their environment. Mako sharks, for example, inhabit tropical and offshore water and are normally a bluish color. On the other hand, the nurse shark has a tan pigmentation ideal for hiding on the ocean’s floor. Tiger sharks can be identified by their stripes and leopard sharks for their spots. Know the sharks that lurk in the water. 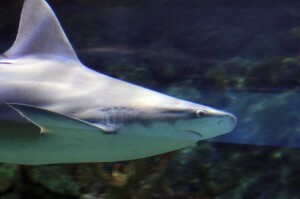 Sharks can be found all over the world from the warm waters of the Caribbean to the freezing temperatures of the arctic. The Gulf of Mexico alone houses more than 50 different species of sharks including, on the rare occasions, the great white shark. The bull shark and blacktip shark are quite common off the shores of Galveston while the Caribbean reef shark is obviously in the Caribbean.